A finely detailed first edition 1794 map of China and Korea by Robert Wilkinson. 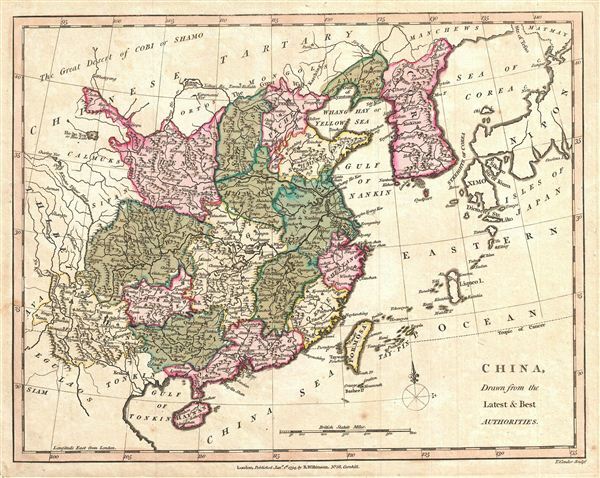 Wilkinson's map covers China in full as well as Korea, Formosa (Taiwan), and parts of adjacent Japan, Tibet, Vietnam (Tonkin), and Tartary (Mongolia). Color coding divides China into its traditional provinces. The disputed sea between Japan and Korea is here labeled the 'Sea of Korea.' Some early maps identify this sea as the 'Sea of Japan' and the two nations have consequently been disputing the 'official' name ever since. Between Formosa and Japan a large island identifies as Liqueo Island is rendered. This is either a mismapping of the Okinawa in the Ryukyu Archipelago (of which Liqueo is a failed transliteration), or a mismapping of Taiwan. engraved by Thomas Condar for the 1794 first edition of Robert Wilkinson's General Atlas.